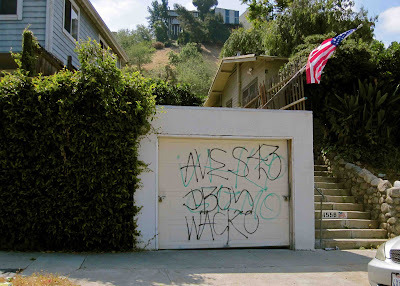 On a weekend where everyone should be bbq'ing with family and friends and remembering our fallen soldiers who fought for us, came a rash of angry ugly graffiti. This poor house's garage on Griffin got it again Friday night. Just a couple days after they finally painted the garage door all nice again from the last tagging (see the Montyheights February '09 posts). Same Highland Park gang. Same garage hit as last time. Gizmo's fault. So, as everyone knows, the local gang needs to "retaliate". 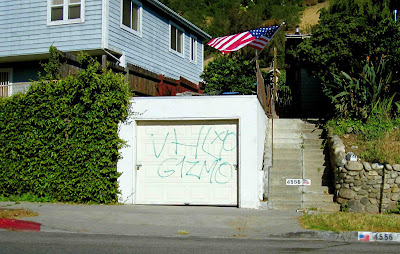 Dboy and Wacko say to Gizmo "I see your green spray paint and I'll use my black spray paint. Take that!" DJ D-Nice Mixtape "The Wackness"
The White Stripes "The Same Boy You've Always Known"
The demise of civilization is evident in everything! ha ha ha!